Gelatin is usually reserved for the youngsters, but when you spice it up with a little alcohol, these jiggly shots become adults-only cocktail recipes perfect for summer. From classic Jell-O shots to apple pie jelly shots, get the party started with these six summer Jell-O shot recipes. When it comes to cocktail recipes, the classics are guaranteed to be a hit. Serve up this original gelatin shot summer drink recipe and party like it's 1999! Read over your gelatin mix instructions to determine how much water your Jell-O box requires. Add half of the amount of water necessary to a pan and bring to a boil. Add gelatin mix to the boiling water and boil until fully dissolved. Remove from heat. Replace the remaining half of water your recipe calls for with vodka and add to the hot gelatin mixture and stir until thoroughly combined. Pour your jelly shot concoction into small cups such as condiment cups or small paper cups and place into refrigerator until set, approximately 2 hours. Then your alcoholic shots are ready for your shindig! Summer berries and watermelon make the perfect Jell-O shot combo for this refreshing summer drink recipe by Jellinator.com. Add both boxes of gelatin mix to boiling water and stir until completely dissolved. Remove from heat and add watermelon margarita mix to the Jell-O mixture and combine well. Pour into condiment containers and chill in refrigerator until set, approximately 2 hours. Once firm, garnish with blackberries and serve! Yields approximately 30 alcoholic shots. 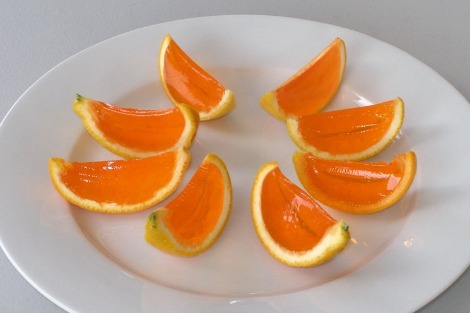 Serve up summer drinks with a twist when you disguise delicious gelatin shots as orange slices in this cocktail recipe by GoodCocktails.com. Slice oranges lengthwise and scoop out the pulp with a spoon. Be careful to scrape the orange all the way to the pith without breaking the rind! Bring water to a boil and add in gelatin mix and stir until Jell-O is completely dissolved. Add vodka to the jelly mix and stir. Place orange rinds into muffin pans to steady and pour gelatin concoction into the orange peel halves; be sure to fill them all the way to the top. Place muffin pan with Jell-O-filled rinds into the refrigerator and chill for at least 4 hours or until firm. Once set, remove the "oranges" from the refrigerator and slice into wedges with a sharp knife. Serve on a platter and watch the reactions from your guests because they'll be priceless! Summer just wouldn't be the same without a patriotic cocktail recipe like these 4th of July red, white and blue Jell-O shots from TheWateringMouth.com. Pour water into pan and sprinkle with gelatin powder. Allow to soak for 1 minute. Heat gelatin mixture over medium heat, stirring constantly until gelatin is dissolved. In a bowl, mix red Jell-O mix with half of the hot gelatin mixture and stir until dissolved. Repeat with blue Jell-O mix in a separate bowl. Divide vodka equally into each of the 2 colored Jell-O mixtures and combine well. Pour each color into 2 separate rectangle or square cake pans and chill in refrigerator until set, about 2 to 4 hours. Once red and blue gelatins are firm, dissolve clear gelatin mix into water and bring to a boil over medium heat, stirring until fully dissolved. Stir in condensed milk and remove from heat. Cool to room temperature to avoid color runs. Remove colored Jell-O from the refrigerator and cut into small cubes. Place red and blue cubes into a 9 x 13-inch glass pan. Once milk mixture has cooled, pour over gelatin blocks and skim off any bubbles that form. Chill until fully set, cut into cubes and serve up this patriotic summer drink recipe at your next backyard bash. 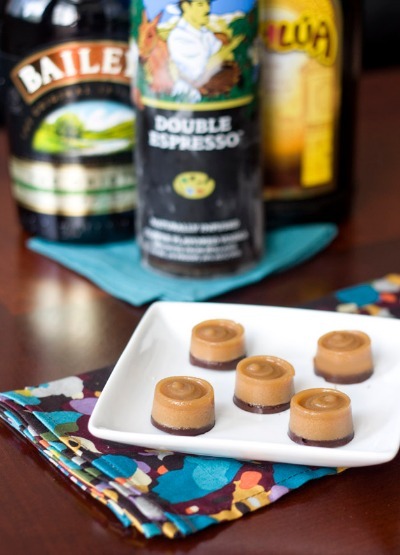 Turn your favorite chilly cocktail recipe into a bite-sized gelatin shot with this scrumptious recipe by EricaSweetTooth.com! Lightly spray mold with nonstick spray and wipe off excess with a towel. Pour Kahlua, Baileys and half and half in a pot and sprinkle gelatin on top. Allow to soak for 2-3 minutes before heating on low and stirring constantly until gelatin is fully dissolved. Remove pan from heat and add vodka. Pour into molds, leaving room for a layer of chocolate in the mold and chill in refrigerator for 1 hour. Microwave chocolate chips in a zip-top sandwich bag for 30 seconds. Cut corner off of bag and pipe chocolate into each mold to the top. Return chocolate-topped gelatin to refrigerator and chill until completely set; approximately 2 to 3 hours. 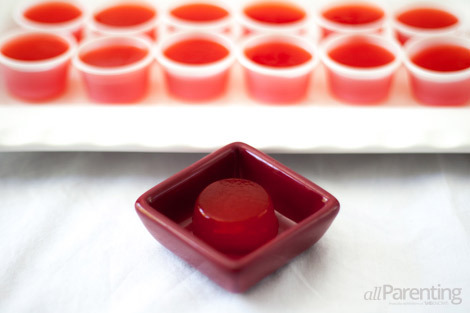 Once your gelatin shots are firm, unmold, plate and pass around at your next party! 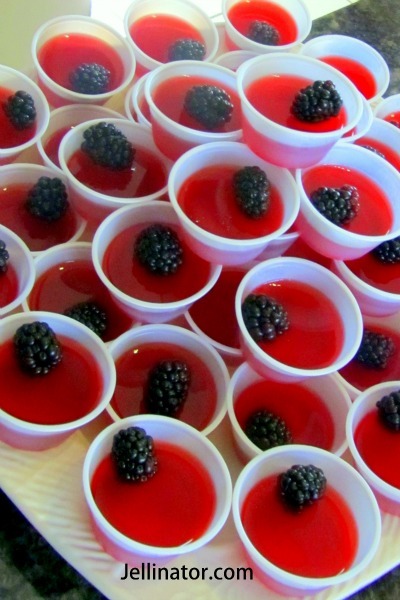 At any summer soiree, Jell-O shots are as American as apple pie. 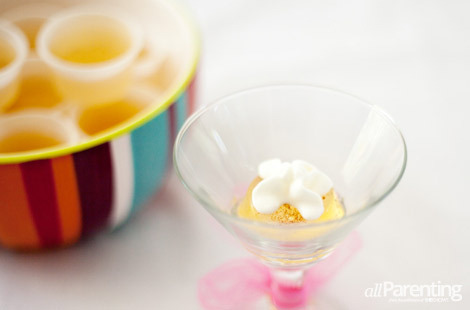 So serve up this twist on the classic alcoholic shot thanks to the help of flavored vodka — yum! Pour 2 cups of apple juice into a pan, add a dash of cinnamon and bring to a boil. Meanwhile, pour vodka into a bowl and sprinkle your box of unflavored gelatin mix over the top. Allow to sit at least 1 minute before stirring. Once apple juice is boiling, remove from heat and pour into a bowl of vodka and gelatin mix and stir until well combined, about 5 minutes. Pour jelly concoction into small condiment cups or paper cups and place into refrigerator until set, about 2 hours. Once your gelatin shots are firm, you can serve them in their containers or unmold them from their cups before revealing to your party guests. Either way, this is 1 summer drink recipe they'll be talking about all year long!